Bradley Corporation was founded in 1921 in Menomonee, Wisconsin. In 1997, Bradley purchased the Mills Corporation, which was the Midwest’s largest manufacturer of metal toilet partitions and bathroom stalls. Mills partitions ship from several locations across the United States. 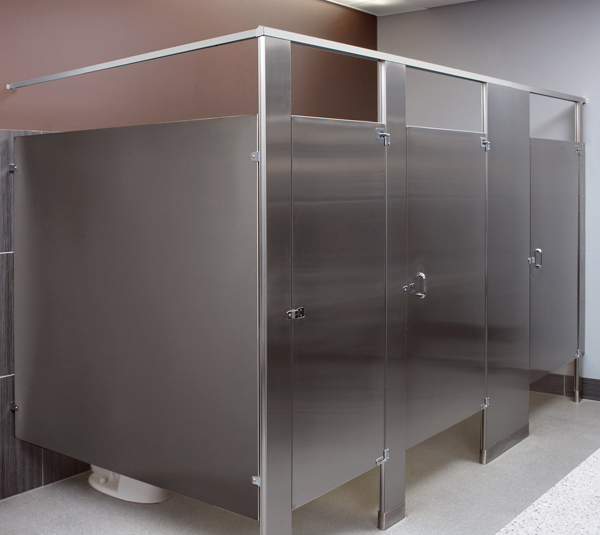 Powder coated steel and stainless steel bathroom stalls ship from Ontario California while Bradmar, Phenolic, stainless steel, and powder coated steel partitions ship from Marion, Ohio. This material is the most economical partition material. It is GREENGUARD certified as a low-emitting material. It comes in 21 different colors including three colors that ship in 48 hours and has no moisture penetration and no rust out. This materials durable baked enamel keeps it looking beautiful for years. Mills Partitions uses a exclusive Permaseal™ edge on their powder coated steel partitions which locks the metals sheets integrally together around the outside of the panel to prevent moisture penetration. It has a 15-year warrantee against rust-out. Available in Sentinel Overhead Braced, Floor Braced, Ceiling Hung and Floor to Ceiling Mounting. This material features a seamless panel and the finish is available in whether satin brush or leather grain texture. It is certified GREENGUARD as a low-emitting material. It is an economical solution to a high traffic restroom. It carries a 15-year warranty against rust out. Mills Partitions uses a exclusive Permaseal™ edge on their stainless steel partitions which locks the metals sheets integrally together around the outside of the panel to prevent moisture penetration. Available in over 19 colors, including two colors that are 100% post consumer recycled HDPE, this material is made from high density polyethylene solid 1” thick plastic. The color goes throughout this product, which means you never have to paint it and scratches can be repaired easily. This material is available a no-site European style for when added privacy is needed. With no gap between the doors and pilasters, European style provides the best privacy in your restroom. Extra height doors and panels are also available in this style for even more privacy. It has an integral hinge system hidden in the door cavity to give it strength and a greater appearance. It is moisture resistant, low maintenance and graffiti can be easily removed from this type of material. This material can also be used for shower stalls. Bradmar Solid Plastic Partitions carry a 15-year warranty. Great for areas of high traffic such as schools, stadiums and arenas. This material is a Mills partition exclusive that provides a decorative high-end commercial partition. It combines granite’s elegant look with a sleek stainless or powder coated steel material. With granite being the most durable material, its strength makes it a great choice where appearance and style are important. Perfect for high-end department stores, boutiques, hotels, art museums, casinos, and galleries. Available in Sentinel Overhead Braced mounting. Available in a large variety of colors, and great in a high traffic area because of its strength and durability. This product is resistant to water, oil and bacteria which is great for medical clinics and hospitals. This material can also be used for shower stalls. It is GREENGUARD certified as a low-emitting material. Carries a three year warranty against delamination and discoloration. Sentinel™ Floor-Mounted Series 400, Overhead Braced bathroom stalls are the most economical partitions where heavy traffic and vandalism might be present. This style of mounting requires no special floor or ceiling construction making installation easy in both new bathroom stalls and renovated restroom stalls. Ceiling Hung Series 600 partitions are great for restrooms that have a low ceiling. This style mounting offers a partition free from obstruction on the bottom to make cleaning of the floors faster and easier. Bradmar Solid Plastic restroom stalls offered in the European Style Design for the utmost in privacy as it leaves no gap between the doors and pilasters. This configuration is available in Floor mounted overhead braced or floor to ceiling mounting. Fushion bathroom stalls combine the beauty and strength of granite with stainless steel for a decorative high-end commercial partition. It offers granite panels, pilasters and urinal screens combined with stainless steel or baked enamel doors for a high end partition. There are four different granite patterns to choose which allows for this to easily match your restroom décor. Maintenance on this material is very low because of its stain and scratch resistant properties. Between walls compartments are located between two existing walls. Corner partitions are available for when a wall is on one end of the bank of partitions. Free Standing Partitions have no end walls, so they require partition panels on each end. Alcove partition layout is a single stall with walls on each end and is usually a larger partition such as an ADA partition. In a Corner Alcove is a single compartment with an existing wall on one end and a partition panel on the other end. Generally this type is larger and works well as an ADA partition. Full height, continuous aluminum wall brackets and integral door hinges are included with partition orders in the Bradmar material.